Toyota Kirloskar Motor has launched the revamped version of its bestselling Multi Purpose Vehicle (MPV) Toyota Innova which has improved interior and exterior features to further enhance its appeal to customers. The company claims that the improved version ensures an enjoyable drive, sense of superiority, exclusivity and enhanced comfort & safety. The new Innova returns best fuel mileage in its segment with 13.7 km /litre (as per standard ARAI test conditions) and is available in four new metallic colours: Light Blue Metallic, Grey Mica Metallic, Silver Mica Metallic and Dark Red Metallic. 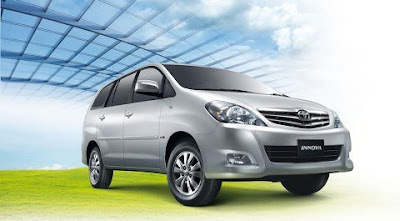 The new Innova has been launched at an introductory price ranging from Rs. 766,000 to Rs. 1,106,000 (Ex-showroom, Delhi). The new Innova comes with a proven, dependable engine platform in D-4D diesel engine and VVT-i petrol engine and has a turning radius of 5.4m, which facilitates easy driving in city as well as highway conditions.